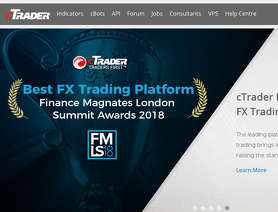 Formerly was xTrader.com. cTrader.com is owned by Spotware.com. cTrader is a forex trading platform. cTrader has been used by multiple brokers. Order execution eventualities are not properly tested. many glitches were found by various users including myself. such as vanishing stop-loss which apparently they fixed/will fix, but there are still unfixed vulnerabilities that I am aware of.